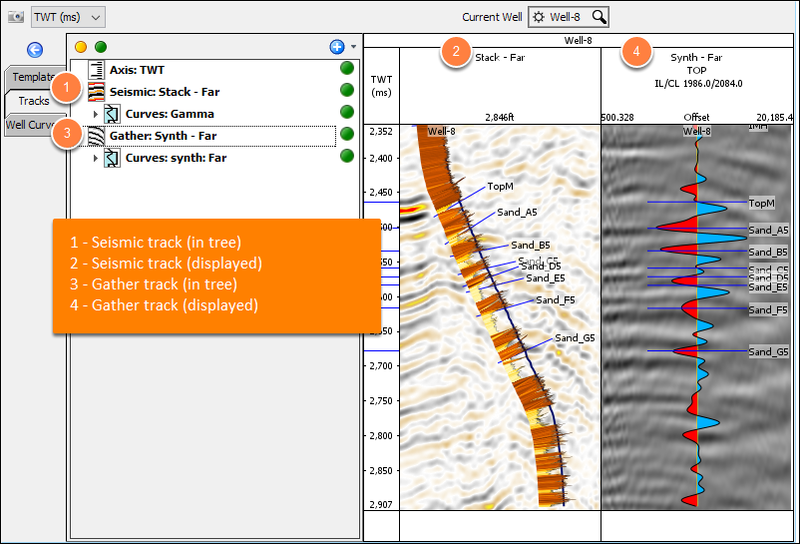 Seismic and gather tracks display data along the wellbore or near the well location. Seismic/gather tracks act as containers for other tracks, such as axis tracks and well curve tracks. 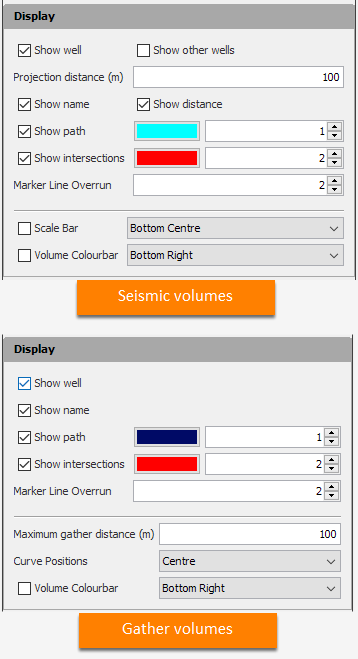 Seismic tracks can display any type of volume. If gathers (4D) are selected, only one plane can be chosen, e.g. display an offset plane from offset gathers, or a frequency slice from spectral decomposition. 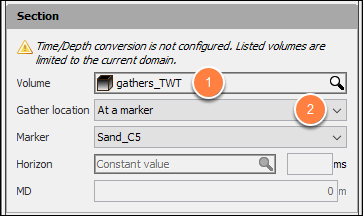 Gather tracks can only display gather (4D) volumes. In the Tracks tab, click the blue "+" icon. Choose Add Seismic Track or Add Gather Track. Select a seismic or gather track in the tree to show the details and settings panels. Appearance settings apply to the entire track. 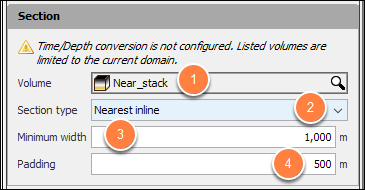 The volumes available for display depend on the current domain. A warning is shown to explain the choices available for the selected domain. Current domain is MDKB. Choose TWT or TVDSS to select volumes for display. MDKB is only relevant for well views. Volumes cannot be displayed in MDKB. Time/Depth conversion is not configured. Listed volumes are limited to the current domain. Volumes are converted to time using the configured Time/Depth Conversion settings. Volumes are converted to depth using the configured Time/Depth Conversion settings. 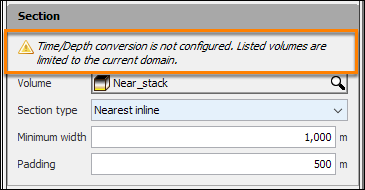 Time/depth conversion is configured and will be used to convert volumes to the appropriate domain. Section settings (seismic) control the displayed seismic section. Select the volume to display in the track. Minimum width: This sets the minimum length of the displayed section. For deviated wells, the projected well path defines the length of the displayed section. For straight-hole or minimally deviated wells, the minimum width is used. Padding: This distance is added to the left and right edge of the section. Section settings (gather) control which gather is displayed. Display the gather nearest to the selected Gather location. Display settings control annotations and other features of the track. Volume Colourbar: Display a colour bar and set the placement. On top: Display well/horizon markers on top of the track. In well views, values are shown from the mouse cursor location in the footer of the seismic and/or gathers track. 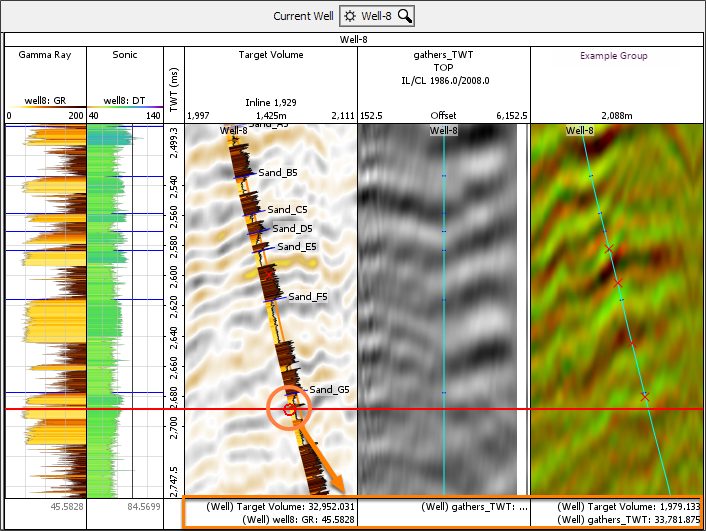 When the cursor is over a well or displayed well track, amplitudes are extracted at the well location. A value is shown for each curve displayed, including the background volume. Values at the well have the “(Well)” prefix. When the cursor is not over a well, the amplitudes are extracted from volume at the exact cursor location.